Infographics visualise data, information and knowledge in a simple way in order to engage your audience with key messages and ideas. Creating graphics, such as charts, maps and icons, enhances the value of information, making it easier to understand. JONO Design can create infographics that reveal what is important, helping to interpret information and getting across what you want to say. 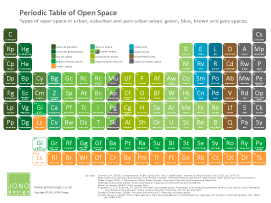 Types of open space infographic. There is a wide variety of different types of open space found in urban areas. Using the design form of the Periodic Table of elements as a template, this infographic shows a range of different types of green, blue, brown and grey space. Click on the picture for more information. The link will open in a new window. A graphic designer's work infographic. Graphic designers work on a wide variety of projects to produce outputs for use online and within printed materials. The infographic visualises the creative work of JONO Design - the types of projects, software tools and outputs. 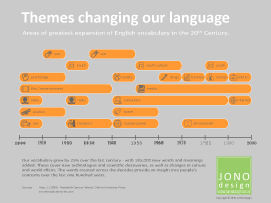 Themes changing our language infographic. The English vocabulary is constantly evolving in response to new technologies and changes in society. The infographic displays the main themes that influenced the creation of new words and terms during the 20th Century. Green infrastructure removes harmful pollution from the air, benefiting our health. 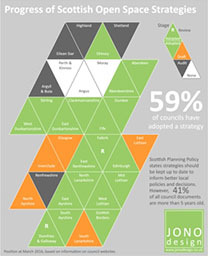 The infographic illustrates the amount of air pollution estimated to be removed by green infrastructure in Scotland. World Cup winning colours infographic. Teams wore strips in a variety of colours at the 2018 Football World Cup. The infographic explores whether colours had an impact on team performances in the tournament. 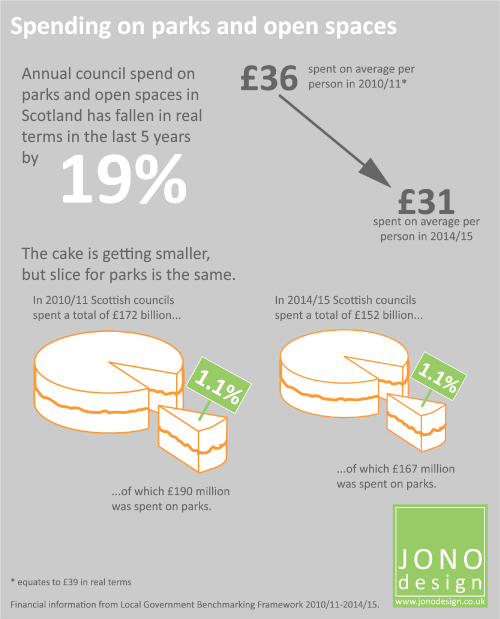 How much is invested in Scotland's parks? 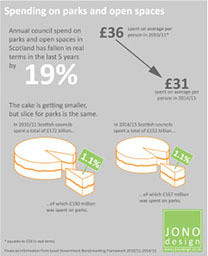 The amount invested in parks and greenspaces is shown in this infographic by comparing it to the total expenditure of councils in Scotland. The parks budget is just a tiny fraction of all council spending, but delivers significant additional benefits. 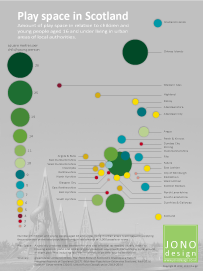 Play space in Scotland infographic. 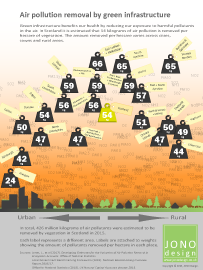 This infographic illustrates the amount of open space for play and informal recreation provided for children and young people across urban Scotland. In Scotland as a whole there are six square metres of play space per child/young person. 5 reasons to choose Word to design documents infographic. Microsoft Word is a popular, practical, customisable, versatile and convenient software choice to design a wide range of documents. Attractive and professional looking documents can be designed using Word and published online or in print. 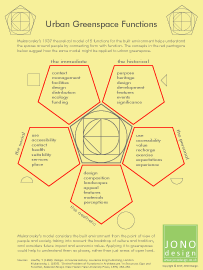 The infographic illustrates how Jan Mukarovsky's model of built environment functions could be applied when assessing urban greenspaces. Applying the model could help to understand the value and quality of our greenspaces by considering how they meet people's needs. What do farmers grow in Scotland? infographic. 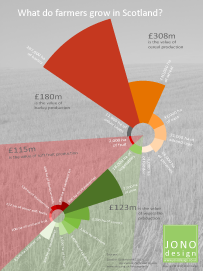 This infographic illustrates the crops that are grown on farms in Scotland. The area of land given over to growing crops, such as cereals, vegetables and fruit, are shown in proportion to each other. These 3 infographics each provide a different comparison of the size of the play area for a selection of sports. The infographics compare the size and dimensions of various pitches and courts, and also show how many play areas can fit into a hectare. Great Trails Network Map infographic. The infographic shows the 28 long distance walking routes in Scotland that are classed as Great Trails. 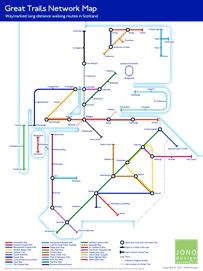 The design of the Great Trails Network Map follows the style of the London Underground map, using the same principles, font and colours. 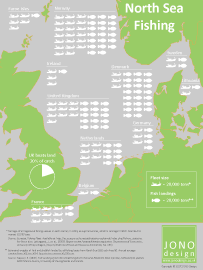 This infographic illustrates the amount of fish caught in the North Sea by different national fleets. An ISOTYPE technique of using symbols shows the sizes of the fishing fleets and the estimated weight of fish and shellfish landed. 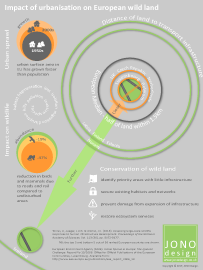 Impact of urbanisation on European wild land infographic. 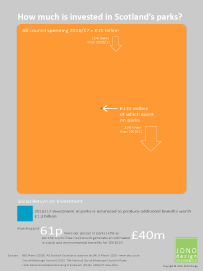 The infographic illustrates research which has found that half of all land in Europe is 1.5km from a road or railway. The proximity of urban infrastructure has a negative effect on wildlife. Strategies to protect wild land from inappropriate development are identified. 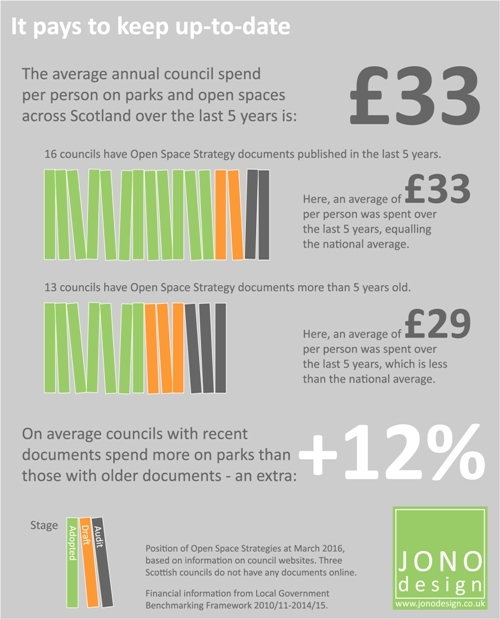 Progress of Open Space Strategies and spending on parks infographics. These 3 infographics highlight the progress of Open Space Strategies in Scotland, comparing this with how council spending on parks has changed over time, and illustrating the importance of keeping strategies up-to-date. Click on the pictures for larger images. Links will open in a new window. Copyright © 2015-2019 JONO Design.